You wanted an intergalactic, thousand-year-long love story? Speculative Japan 3 has it. You were interested in some short, cutting satire? Yup, Speculative Japan 3 has that too. And world-ending experiments? Clones? Invisible undergrads? Speculative Japan 3 has you covered. SJ3 starts off with two short pieces that quietly lure you in and then pounce, and it only gets more intense from there. After all, the variety of themes and treatments here is one of the collection’s strengths. 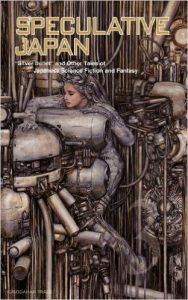 And with all of these stories having been written between 2000 and 2011 (with the exception of “Silver Bullett,” written in 1977), you know that you’re reading some of the most fascinating speculative fiction to come out of Japan in recent years. Furthermore, some of these talented translators will be familiar to you if you’ve been paying attention to recent publications of Japanese sf in English: for example, Daniel Huddleston is translating the Legend of the Galactic Heroes series (out from Haikasoru), and Jim Hubbert recently translated Taiyo Fujii’s Gene Mapper and Miyuki Miyabe’s The Gate of Sorrows. So which stories in SJ3 were my favorites? It’s quite hard to choose, actually, since they’re so different from one another. There were a few, though, that left me staring into space for several minutes trying to process what I had just read. Let me talk about those. First was Fujita Masaya’s “Angel French,” a story about friendship and love transcending space, time, and the human body. When an engineering student uploads his “brain data” into the artificial intelligence module on a probe (Voyager 3) headed into deep space, he leaves on Earth a close friend (Subaru) who winds up devoting her life to following the probe’s progress after the engineering student dies in a plane crash. Not content with simply tracking the probe via her radio telescope expertise, Subaru decides to become the brain of another probe, one that would find Voyager 3 and let her communicate with her friend once again (and for thousands of years to come). It’s a quiet, unembellished piece that carves itself right into your heart. “The Finish Line” by Matsuzaki Yuri, on the other hand, was a fun (if freaky) response to one of science’s “what ifs?” As one of the characters asks, “if a single gene could be amplified into some crazy amount, such gargantuan numbers that the other genes could never even hope to catch up, then boom, the end–wouldn’t evolution be over?” (42). In order to prove his recently-deceased mentor right and his mentor’s “enemies” wrong, Ikaru decides to run an experiment doing just that- amplifying a cytoskeletal fiber until the world ends (something he’s sure won’t happen). And yet…I must admit, I especially enjoyed this story because it reminded me of one of my favorite stories of all time: “The Nine Billion Names of God” by my boy Arthur C. Clarke. And then there’s “To the Blue Star” by Ogawa Issui, a brain-bending thought experiment about what humanity would look like in the year 298504 (hint: we wouldn’t have bodies anymore). In fact, humanity would be part of a sphere calling itself “X,” which contained human consciousnesses distributed among two thousand linked starships. It’s mission: to make contact with other species. This isn’t as straightforward as it sounds, but after some disastrous encounters, X is approached by the Overlords, who encourage it in its mission and the function for which humans created it: to explore and connect civilizations. Each of these stories is well worth a read. I also appreciated the translator bios at the end, but would also have liked bios of the authors. Overall, a great collection.